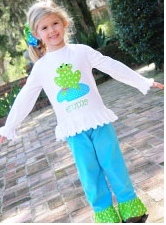 I am happy that you were so excited about the Kelly's Kids Giveaway! Be on the look-out for a facebook message from Hollie with the details about your win! Thanks to everyone for participating. I appreciate you following my blog and all your support. And a big thanks to Hollie for the great Kelly's Kids giveaway prize. This week I am relaxing with my family, so here is a 'rewind post'. It is a little something I wrote for SouthlakeMoms last month. Summer has rolled in, bringing high temperatures and relaxed days. Each afternoon while our baby naps, my big girl and I like to do some special things together. Things that would normally be hard to do when baby Maisy is awake. We usually read, practice numbers and letters, and then make a craft. The other day we decided to paint. I had some old wood planks in the garage that I had been saving for 'just the right inspiration'. We pulled out acrylic paints and a few brushes. Afton began by experimenting with painting princesses, castles, and rainbows. 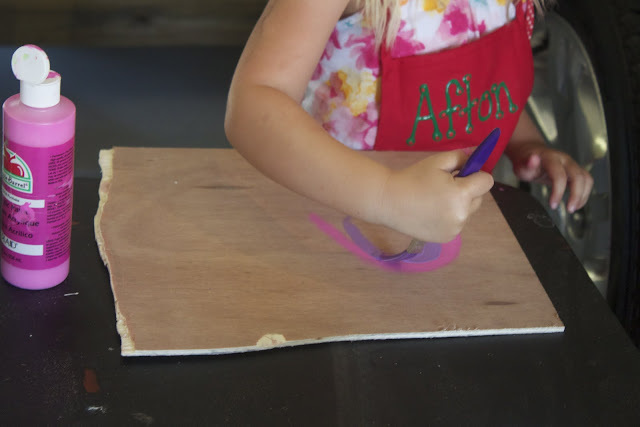 We did our work in the garage with aprons and an old card table. That way, messes and paint splatter weren't even part of our conversation. I set up the box fan and opened the doors to let the air blow through. I love these times, busy hands always make for the best talks. 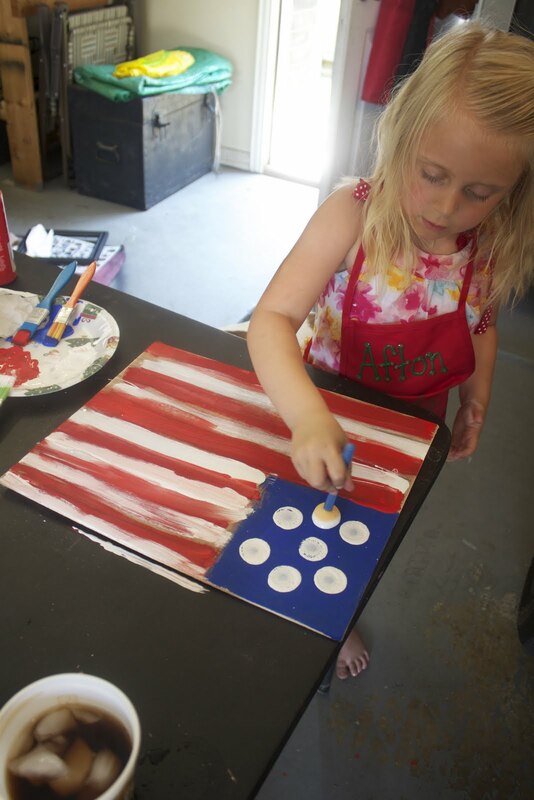 As we continued to work, Afton decided to create a American flag. 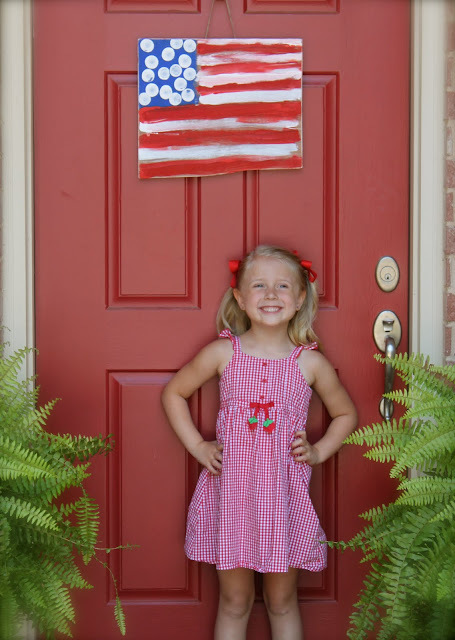 If it turned out just right, she was hoping to hang it on the front door in honor of the Fourth of July. I helped her sketch out the 13 stripes and we chatted about their meaning. She guessed that her flag would need about 'a million' stars. So we had a little conversation about the fifty stars as well. While she got to work with her red paint, I looked down at my project. I have been a bit obsessed with 'Chevron Stripes' for awhile now. Probably ever since I started watching the Nate Berkus Show and his beautiful zig zag rug caught my eye. So when I looked at my old chippy piece of wood, I knew it was destined for some geometric stripes. 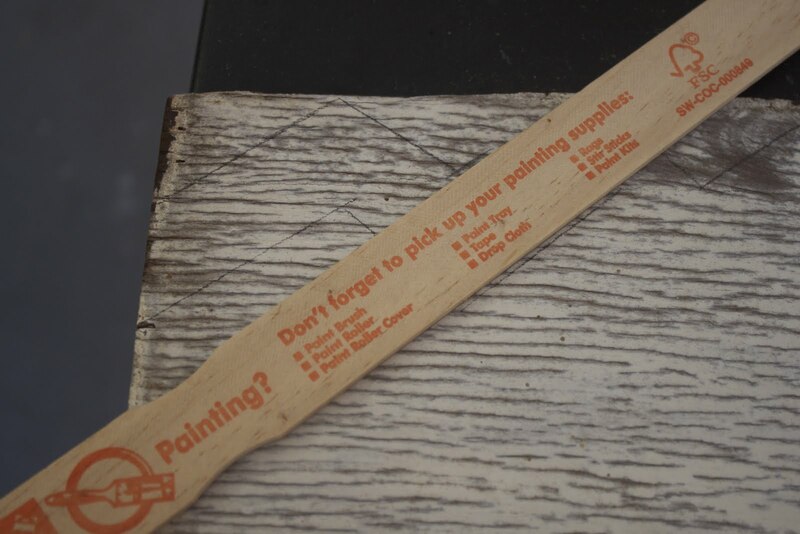 I used a paint stirring stick I found on the work bench to serve as a pattern. Using a pencil and absolutely no exact measuring, I sketched out the design. Glancing back across the table at Afton, I noticed her flag was missing a few stripes and stars. But since we had already had our 'mini-history' lesson, I decided she deserved some creative freedom. The distressed look of the wooden plank in front of me was the perfect backdrop for a twist of modern design. After two coats of paint, I left it to dry a bit. Then I roughed up the edges using sandpaper. I focused the most 'wear' on the edges and corners. I didn't want the paint to look too perfect. Finally I finished up my project with a stencil and some black paint. Just as I was finishing the last letter, our baby woke up. Which is why the phrase I painted on is so fitting... "More ideas than time". 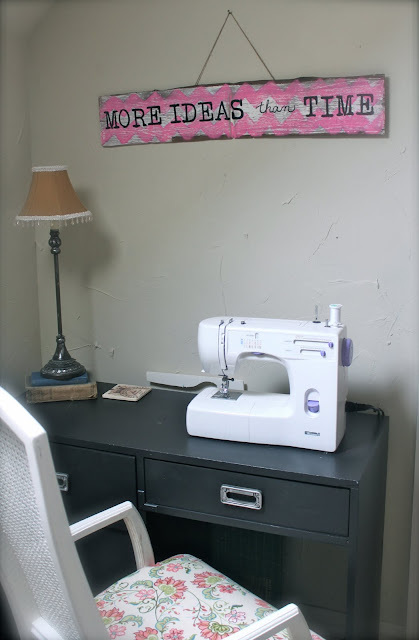 The sign is now hanging happily above my sewing machine. And Afton's flag is proudly displayed on the front door.